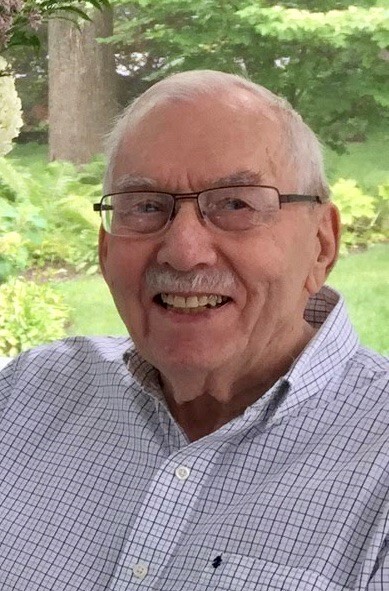 George Kovacs, 91, passed away with his family by his side in Rock Island, IL on April 16, 2019. George was born in Novisad, Serbia (formerly Yugoslavia) to Alexander and Clara (Biro) Kovacs on July 29, 1927. George spent his early childhood in Novisad and Budapest, Hungary; was educated in Milan, Italy; and graduated at the age of 16 from Oakville High School, in Oakville, Ontario, Canada. While in high school, he ran the family farm in Oakville where he and his parents lived as homesteaders and war refugees from 1939 to 1945. George began his career at the age of 17 as a trainee working in various North American factories for Massey-Harris Ltd. first in Canada, and later with Massey-Ferguson in England, France and Italy. In 1957 he joined John Deere & Co. at a time when the company was developing its overseas markets. He worked in overseas marketing, first in Belgium, then in France, and later as export manager for the John Deere branch in Mannheim, Germany. George retired at age 55 from the corporate planning department at Deere in Moline in 1982. George met and married Ann Beaumont while he was working in England for Massey Ferguson, and they were married on July 7, 1956 in Kenilworth. They lived in England, Belgium, France, Germany and Canada before settling in Rock Island with their three daughters in 1970. In 1992, after 22 years in the US, George and Ann became US citizens. In his lifetime, George lived, worked and travelled extensively throughout Europe, North and South America and the Middle East. George’s fluency in six languages played a significant role in his successful business career. During retirement George served on the Board of Trustees of Friendship Manor; worked as a consultant to several start-up businesses; joined SCORE in 1996 and was a past president of the Quad Cities SCORE chapter. He authored many SCOREboard articles that appeared monthly over his byline in the Quad City Business Journal. A passionate and inspired gardener, George was always happiest while working outdoors. The family wishes to extend their gratitude to the staff and caregivers of the UnityPoint at Home hospice program. A family celebration of George’s life will be held at the Kovacs family home in Rock Island later this summer. Memorial donations in George’s name may be made to Edwards Congregational United Church of Christ in Davenport, IA or to WVIK Radio in Rock Island, IL.